With Mother’s Day coming up shortly do you want to get your fellow Mom friends a little present to show that you love them as a friend and mother? 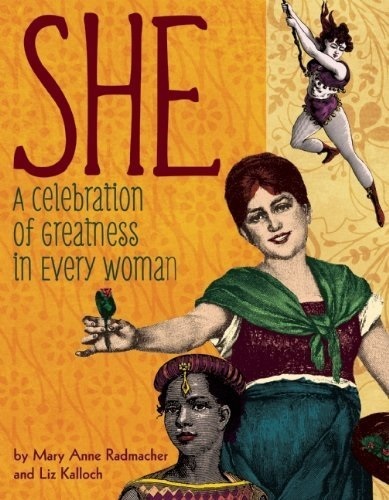 She: A Celebration of Greatness in Every Woman is a well thought-out book of inspirational quotes and wisdom, not to mention, its beautifully illustrated. This book is a book that celebrates the power of women. It is an excellent gift for moms to be and new moms and maybe to honor a grandmother as well. It makes a wonderful keepsake for your girlfriends who are mothers also! Authors Mary Anne Radmacher and Liz Kalloch took great time in choosing quotes and inspirational wisdom in the book. Each section is divided by qualities every great woman has. For example “She is Inspirational” or “She is Welcoming”. If you need a pick-me-up or some inspiration on your own, just flip to the corresponding feeling and get that daily dose of confidence! We keep this book on our living room table for guests to see and read. Its a beautiful read and its decorative, so it should be in a place in your house so it is seen! Purchase She here!